Skopelos Press Business Nomad: Lean Outside the Factory - Reverse Magic! Lean Outside the Factory - Reverse Magic! A few years back, I had the pleasure of taking my teenage daughters, Katie & Eleanor, to Las Vegas. We'd hoped to see the great magician, David Copperfield, who I'd seen make tigers, elephants and the like disappear. On TV I saw David make the Statue of Liberty disappear. Lean's next frontier is the office -- sales, marketing, engineering, design, planning & scheduling, finance and so on. 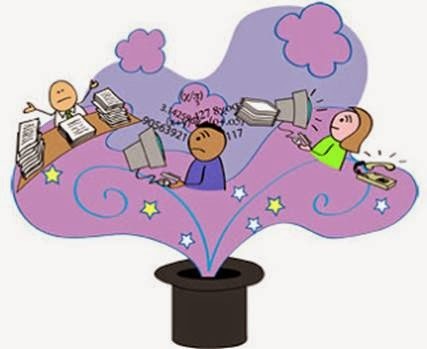 Deploying the "profound system of knowledge" here requires us to perform reverse magic. David Copperfield makes visible things, invisible. We have to do the opposite & make the invisible, visible. Office work, is what Peter Drucker called "knowledge" work - most of it is hidden in the box knows as a computer. Our job is to take it out that box and put it up on the wall, where everyone can see it. Otherwise, waste multiplies exponentially, and our office processes become our constraint. Where is most of the delay -- in operations (factory, hospital ward, laboratory etc) or outside operations? If you're like many organizations, most of the delay in outside operations. Yet where do we spend most of our improvement work? So...let's work our magic and make the invisible, visible. PS That's what The Remedy is all about.